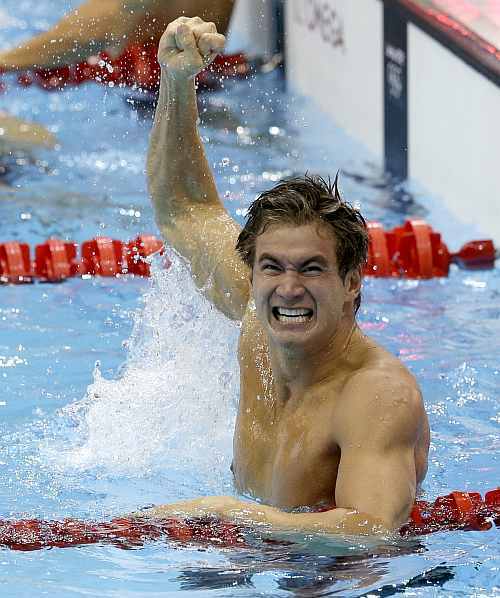 Nathan Adrian took out the Missile by a fingertip. Daniel Gyurta and Rebecca Soni took down two more world records at the pool. Adrian, a 23-year-old largely overshadowed by American stars such as Michael Phelps and Ryan Lochte, made a name for himself by winning the 100-meter Olympic freestyle Wednesday. He lunged to the wall to edge James "The Missile" Magnussen by one-hundredth of a second — the slighest margin possible — and again deny Australia its first individual swimming gold of the London Games. Adrian pounded the water, then put his hands over his eyes while dangling over the lane rope, as if he couldn't believe the "1'' beside his name. Magnussen hung at the end of the pool, staring straight ahead at the wall in disbelief, the wall he got to just a fraction of a second too late. "I had no idea, to be honest," said Adrian, whose winning time was 47.52 seconds. "I'm a guy that has a lot of speed and I can go out fast and I die a little more than he does. It's a little nerve-racking the second 50. I just had to really focus on it and stay strong." Gyurta set his world record in the 200 breaststroke, needing every bit of it to hold off Michael Jamieson's furious bid for Britain's first gold at the pool. 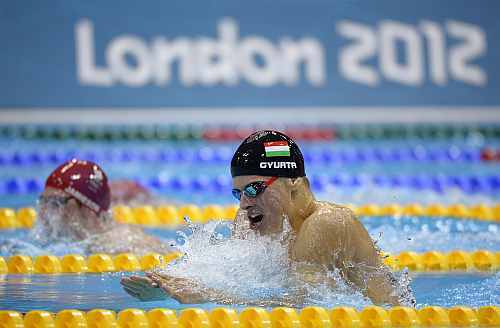 The Hungarian touched in 2 minutes, 7.28 seconds, shaving 0.03 off the previous mark set by Christian Sprenger of Australia at the 2009 world championships in a now-banned bodysuit. Soni showed plenty of speed in the women's 200 breast — and it wasn't even the final. Swimming a semifinal heat, the American touched in 2:20.00 to break yet another of the bodysuit records, a time of 2:20.12 set by Canada's Annamay Pierse at the '09 worlds, the fifth world mark to fall at the London Games and further proof it's still possible to go fast — really fast — in textile suits. There was even more heartache for the Aussies in the last event of the night, when Allison Schmitt chased down Alicia Coutts to give the Americans gold in the 4x200 freestyle relay. Schmitt dived in the water about a half-second behind, but passed Coutts on their first return lap and won going away in 7:42.92. The Australians settled for another silver in 7:44.41, while France took the bronze. Schmitt is turning into one of the biggest American stars of the games, picking up her second gold to go along with a silver and a bronze. Seventeen-year-old Missy Franklin also picked up her second gold swimming the leadoff leg, and Dana Vollmer claimed her second gold in London. Shannon Vreeland rounded out the gold medal-winning quartet. Adrian came through with the race of his life, giving the U.S. its first title in swimming's signature event since Matt Biondi at the 1988 Seoul Olympics. Canada's Brent Hayden took silver in 47.80, his country's first medal ever in the furious down-and-back sprint.